The Bike Shop / Re: JCPC question. The Bike Shop / JCPC question. New condition stranger zia frame. 20.75 top tube. Built and rode once. Figured out I wanted a frame with brake mounts. I'll let it go for 255.00 shipped in the lower 48. includes used 22mm bb and anything else I might put in the box. No trades. 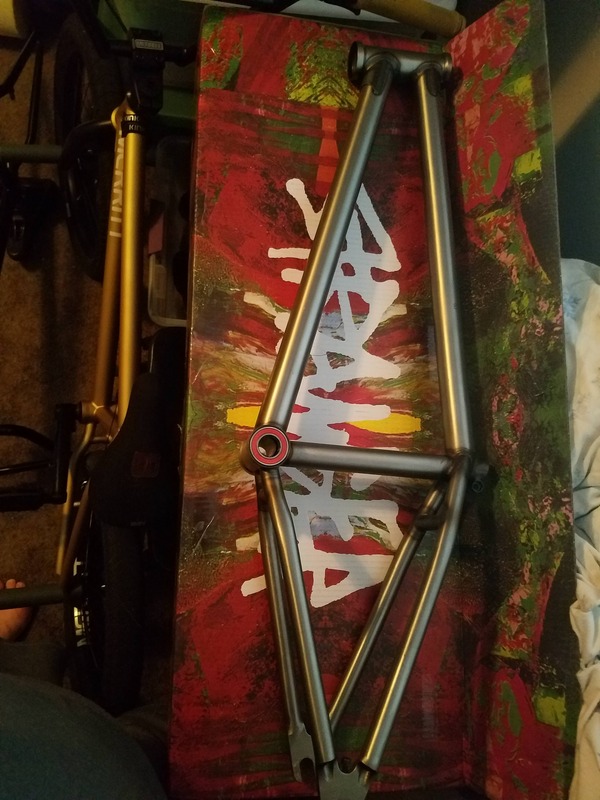 Sell and Swap / Re: WTB: Frame for street/flat build. I might have a 20.5 FBM bellwitch with removable brake mounts. I wish I could get my baby blue coup d'etat frame... nice bike! There is a crew of younger dudes that ride where I live that I think are horrible, so when I see them I just wave and say hi and be polite and try to not get lost in the vape clouds that follow them while they are intsagramming the sweet flyouts they do. They kind of soured me on the younger riders coming up until me and my two friends that are older were riding this ledge spot a couple weeks and a kid we had never seen or met rolls up gives us a nod and just shreds with us. It gave me hope that out there in this world is still a new crop of younger guys that just want to ride bmx and have fun. I seriously just watched it the other day and can't remember what video it was. But I thought it was the Urge Overkill cover of the song not the Neil Diamond version. Also I could be crazy and oh just made this all up in my head. Me and a buddy are heading down to LA in feb 19th for a week to escape what will probably be a garbage cold winter in Eastern Washington. We are kind of going in blind. I figured we would hit that outdoor vans park and maybe that indoor Vans park as I have always wanted to ride it. I grabbed a hotel near Vine and Melrose for the week just so we would have a spot to stay. Couple questions.... Is there some places we should make sure to hit while we are down there? Is there some places we should stay away from. We were wanting to get out an explore the city and ride some street also. Looking to picky up a model c or wave c frame a fork possibly. Let me know if there is one around. I'll do 175 shipped. I need to move this to buy more fishing rods. I would probably take a ridiculous offer to sell this frame.